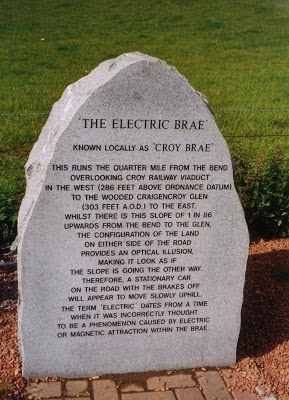 The Electric Brae is a gravity hill in Ayrshire, Scotland, where cars appear to be drawn uphill by some mysterious attraction. 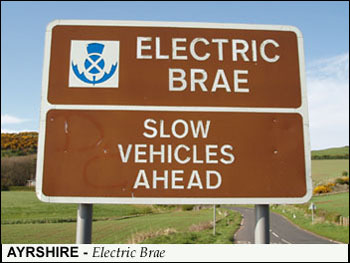 The Lowland Scots word brae means a hill-slope or brow (with which it is cognate), and the "electric" name was given when electricity was a new technology associated with strange forces. There is more than one stretch of road known as Electric Brae, but the most famous is on the A719, south of Dunure, not far from Ayr, between Drumshrang and Knoweside. Though the road appears to be running uphill, a suitably free-running vehicle will slowly move off from a standstill. It was widely believed that vehicles were being propelled uphill by a mysterious magnetic force, but the road's apparently uphill slope is an optical illusion. Metal road signs which used to mark the place have tended to be taken by visitors, and have been replaced by a stone inscribed with an explanation of the phenomenon. During the Second World War, the brae was visited by many American personnel from the air-base at Prestwick, and General Dwight D Eisenhower, who had a flat at nearby Culzean Castle, took visitors to see the phenomenon. In 1992 the name was brought wider fame by the novel Electric Brae by Andrew Greig. The name has also been applied to other slopes in Scotland. This phenomenon has also been observed elsewhere in the world, for example outside the Garda station in Blackrock in Dublin, Ireland. There are hundreds of gravity hill locations around the world - see list of gravity hills. The explanation often given for the phenomenon is that of a visual illusion, similar to the well-known Ames room, in which balls can also appear to roll against gravity.